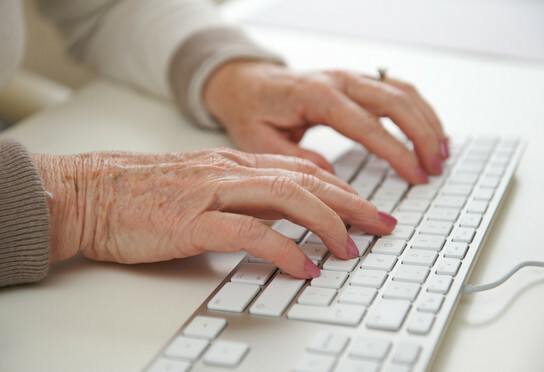 The friendliest, easiest email client for seniors. Completely web–based, nothing to download or install. Works with your existing email address. 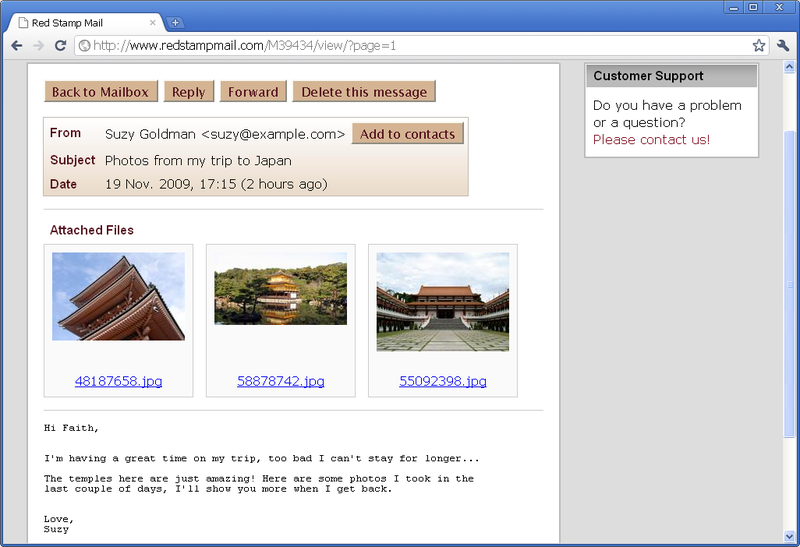 • Presents your mail in a clear and simple format, grouped by day of arrival. • Provides simple ways to search and filter your messages. • Messages from people you know are clearly marked, so it's easy to filter out spam. • Message information is shown in a clear and concise manner. • Large buttons specify all the things you can do with this message. • Attached files are displayed prominently, with thumbnails. • Hovering over a link in the email shows you exactly where it will take you. 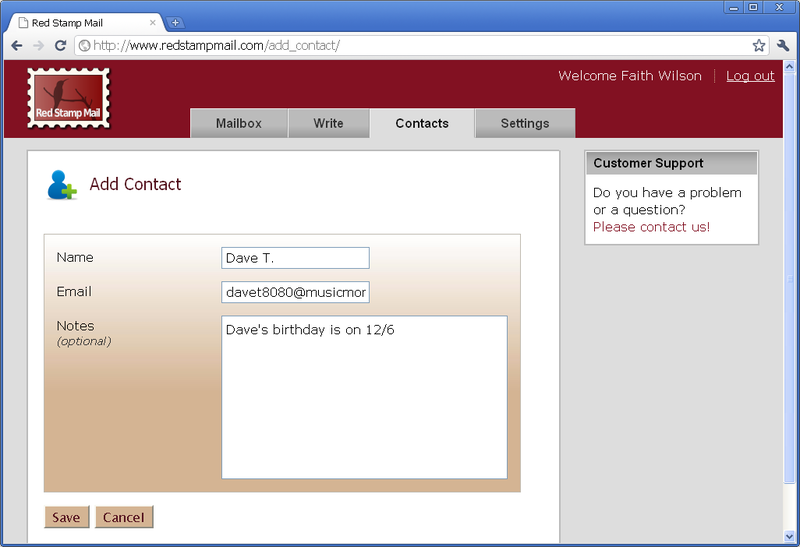 • The contact list is highly simplified, keeping only each person's name and email address. • If you are using a webmail account, Red Stamp Mail will import your contact list automatically. • If not, you can use our “suggest contacts” feature which tries to guess who you know by the contents of your mailbox. • To help users with imperfect eyesight we chose large, clear fonts and a high-contrast color scheme. • Dragging and double-clicking is never used, since these mouse gestures may be difficult for seniors. • You don't even have to use a mouse! Everything can be done using keyboard navigation. 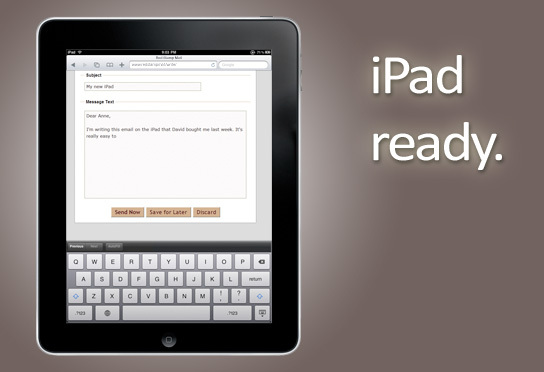 • Apple iPad's simple and intuitive interface makes it perfect for seniors. • Red Stamp Mail is the first (and only) email solution for seniors that is iPad-compatible. I am looking forward to finally having email that both my parents can use no matter how they age or what comes after every new version of Windows. I opened up an account for my mother today (she is 83 and was finding it hard to use email) ... complements on the design. 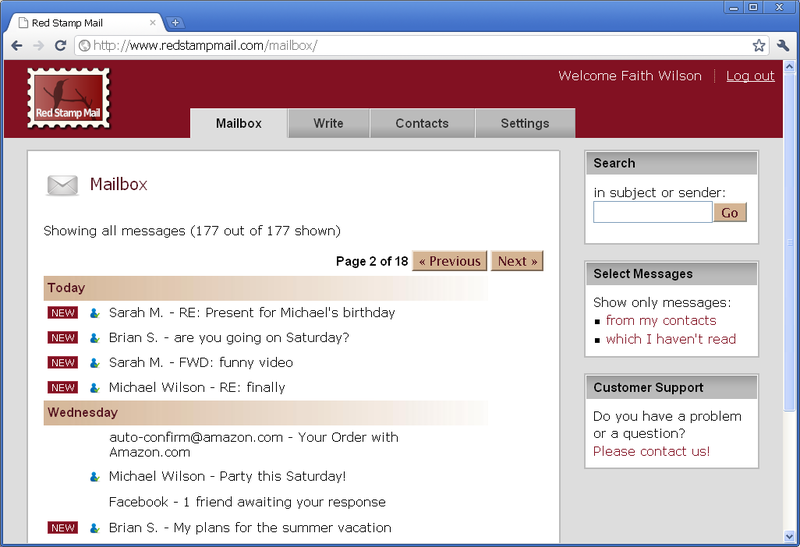 I think the Tabs are great and also the big buttons and the "Today", "Last week" sorting of mail. She found it easier to "catch" than other emails she tried. It was funny seeing my 76 yr old mother (who has no tolerance for the computer or answering her friends when they write) say "oh yeah, I could see how this would be a lot easier than what we are using now....ONCE I GET USED TO IT." Want to see if Red Stamp Mail is right for you? It's easy to set up an account for a loved one.